ISTAT Americas Program Now Available! ISTAT Grants – Applications Open! 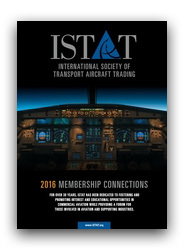 Have you seen ISTAT's 2016 Membership Connections? The program for ISTAT Americas – 5-7 March 2017 at the Hilton San Diego Bayfront in San Diego, CA, USA – is now available! ISTAT Americas will feature fitting sessions with leading aviation professionals and networking events with opportunities to grow business and make deals. Click here for the program and register early to secure housing! ISTAT has officially opened sponsorship for its 2017 events. Take advantage of one of the many opportunities to showcase your firm, and show your support for ISTAT. Jack Feir, a legendary aviation figure known for his contributions to aircraft appraising and ISTAT's early beginnings, has been awarded an engraved, silver flask from the ISTAT Appraisers. 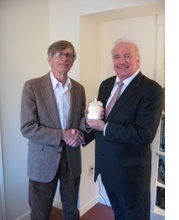 Engraved on the flask is the message, "Presented to Jack B. Feir, ISTAT Member Emeritus, Appraiser Fellow, by the ISTAT Appraisers Program for 32 years of wise and faithful service. 1983-2015." Thank you, Jack! New this year, the Foundation is launching a video series on social media called, "ISTAT Gives Back". Each month, one of the five giving programs of the Foundation will be featured: Scholarships, Internships, ISTAT University, Grants and Humanitarian Aid. Check out this month’s ISTAT University student feature below! The ISTAT Foundation is accepting applications for grant funding of up to $10,000 USD to non-profit organizations around the globe that advance commercial aviation. Do you know of a qualified candidate? Visit www.istat.org/grants to learn more. Joe Ozimek recently retired after a fruitful career in aviation. In this exclusive interview with Jetrader, we asked Joe about his involvement in the 747 program, what it was like sharing an office with Joe Sutter, who led the development of the 747, and what's next for him. Advertising space will soon be available in the summer 2017 issue of Jetrader magazine. Beyond our normal distribution to all ISTAT members in both print and interactive digital editions, this issue will have significant bonus distribution at the ISTAT Chalet at the 2017 Paris Air Show in June. For year-round access to ISTAT members, please reference the advertising opportunities available through ISTAT and Jetrader by clicking here, or by contacting: Erik Henson, Jetrader media director at +1 352-333-3443 or ehenson@jetrader.org. Your digital edition of ISTAT’s 2016 Membership Connections is always available online in a convenient digital format for browsing at work, at home, or in the field. We appreciate your support of the International Society of Transport Aircraft Trading and our Advertisers who helped make this publication possible. The Hill Aviation groups are suing the Obama administration over its controversial decision to approve Norwegian Air’s bid to fly to the U.S., arguing that the move is a threat to American jobs. AviTrader The news that Lufthansa plans to wet lease 38 aircraft from its competitor, airberlin, has resulted in Ryanair CCO, David O’Brien, announcing at a media briefing in London that the Irish low-cost carrier will soon be lodging a complaint based on the grounds it is anti-competitive. IndustryWeek In a visit to Washington, Paulo Cesar de Souza e Silva, president and CEO of Brazilian aircraft builder Embraer, sat down for a roundtable with editors from Aviation Week & Space Technology and sister publication ATW. Following are his remarks about the company’s commercial aircraft unit and ambitions to expand its aftermarket business.